Graphically displays the frequency of use and use of your computer. 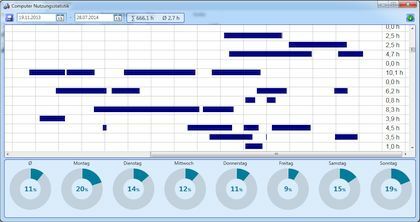 This program graphically displays the usage statistics of your computer/notebook in an overview. When turned on my computer? How long did my computer? When I turned my computer off? How often I'm on the computer? How long am I average on the PC? How many hours has my laptop? Days of the week is my computer most frequently used? When was my laptop turned on?